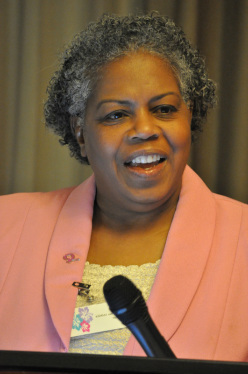 United4theCause is a non-profit organization founded by Karen White, Ed.D. Her journey to building the organization began May 10, 2011 when diagnosed with Triple Negative Breast Cancer (TNBC) at age 51. In response to Karen's diagnosis she began researching best treatment options and survival strategies. Karen found TNBC to be a new and aggressive form of breast cancer that disproportionately impacts African American women. Tall, short, skinny or fluffy women with big or small girls (breasts) can be diagnosed with breast cancer. Women ages 13 to 91 have been diagnosed with TNBC. Why? No one knows. What we know for sure, TNBC is aggressive. Early detection is the key and if diagnosed, one must take action. Characteristics of TNBC are unique as this breast cancer subtype does not have the traditional biomarkers (Hormones -ESTROGEN, PROGESTROGEN, and HER2) that is typically found in other cancers. Successful treatment for TNBC consists of the 3-PUNCH KNOCKOUT- chemotherapy, radiation, and surgery. After extensive research, meeting with numerous oncologists, surgery, 8 rounds of chemotherapy, and 30 radiation sessions. Karen is a 7 year Triple Negative Breast Cancer Survivor. Praise God!!! Thankful to God for the miracle of restoring her health, Karen is dedicated to sharing her testimony and serving others as a Cancer Care Minister. She also has a passion for educating women on breast cancer awareness, preventive measures via motivational speaking engagements, individual coaching and facilitating a monthly support group. Additionally, Karen is a trained/pending certified Christian Life Coach with a specialty niche in Women - Breast Cancer Survival and Leadership Development. United4theCause, a faith based breast cancer organization is committed to raising breast cancer awareness, promoting early detection, saving lives and supporting TNBC research studies. United4theCause has a Board of Directors consisting of 10 professional members, 2 ex officio Board Members, and a host of friends, supporters and volunteers. United4theCause ministry philosophy of service is built on the By Our Love model (designed by our founder) and the Ministry of Healing book. Our phenomenal Board Member Sisterhood is dedicated to implementing United4theCause mission by assisting and showing compassion to individuals on the cancer journey.